Best of luck, Mike. 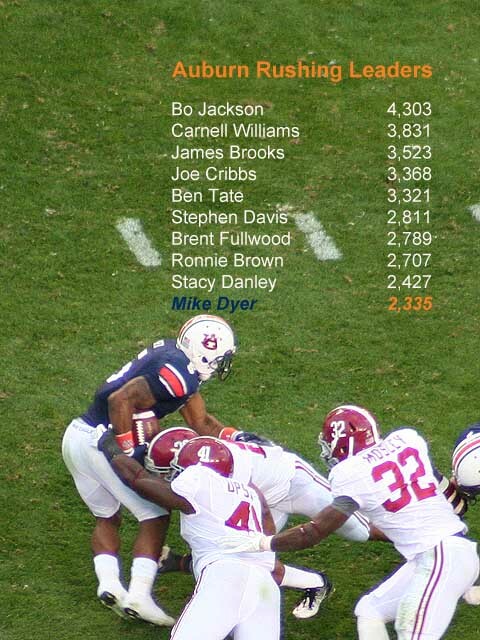 It seems this might have been one of the last carries in Mike Dyer’s storied Auburn career. Dyer, who broke Bo Jackson’s freshman rushing record and slid into the vaunted top 10 of rushing at Auburn in just two years, is reportedly taking his ball and going … somewhere. Rumors have become tangible fact according to the latest word from Phillip Marshall, who says Arkansas State reportedly remains on Dyer’s radar. With the BCS MVP packing his things, Auburn will look to Onterio McCalebb (who is pondering the NFL), Tre Mason, Mike Blakely (who redshirted this year) and Corey Grant (who sat out a transfer penalty this year) to pick up the slack. Also in the pipeline is ESPN’s four star recruit Jovon Robinson, who is a verbal commit out of Memphis. It really would have been an embarrassment of riches if Dyer had decided to stay at Auburn. The guys who are staying in blue, though, will be running behind an offensive line that has had a year to gel and a new offensive coordinator to be named later, of course. And while the No-Whistle Missile is leaving town after a team suspension and amid a great many rumors, we’ll wish him well. To transfer to Arky State and sit out a year makes no sense. And to transer to I-AA or D II makes even less. AU has good depth at running back and will be fine. Dyer I am not so sure about. Yep, I know zilch about what the REAL story is, but Auburn is in a better place than Dyer from this parting of ways. I hope he finds success wherever he ends up and can overcome whatever is making him unhappy. I am confident Chizik is doing what he needs to do for the betterment of the team. Until I know more, I can only have faith that that is the case. With that said however, I will always be a fan of Dyer. I typically am with Auburn’s transfers. Generally, so long as you don’t pull a bunch of garbage like Raven Gray and those guys did last year, you are good in my book and your time with us is appreciated. I mean, who among us doesn’t pull for Brandon Jacobs on Sundays? War Eagle, Mike. Best of luck. Are we sure he’s transferring? I keep hearing that he’s not. I believe that if he wants to leave we are better off without him. I still appreciate what he did for us for the two years he was here.